Primary Natural Resources fish, timber, phosphates, bauxite, petroleum. 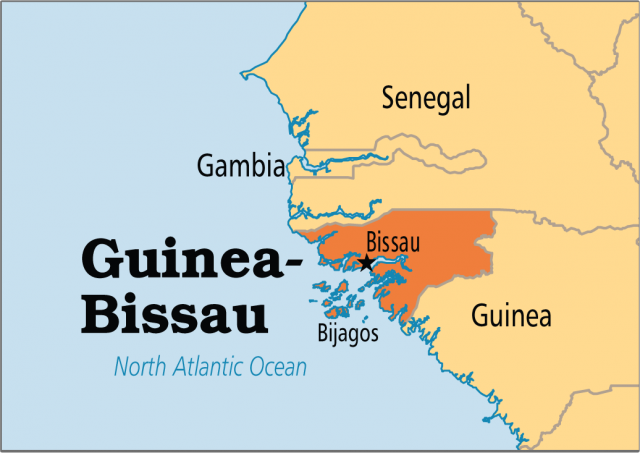 THE REPUBLIC OF Guinea-Bissau, commonly called Guinea-Bissau, is a tropical West African nation-state. The borders include the ATLANTIC OCEAN on its west, GUINEA to its south and east, and SENEGAL to the north. Guinea-Bissau is an ethnically diverse country. While most of its residents are indigenous Africans, they belong to various ethnic groups. Thirty percent belong to the Balanta group, 20 percent are Fula, 14 percent are Manjaca, 13 percent are Mandinga, and 7 percent are Papel. The remaining are of European descent or mixed African and European ancestry. Approximately 50 percent of the population adheres to indigenous African religions that recognize many deities and venerate ancestors. Forty-five percent identify themselves as Muslims and 5 percent as Christians. Portuguese is the official language of the country, although such native languages as Fulah and Mande are also in wide use. The area was home to agricultural groups during the European Middle Ages. In the centuries before European contact, Guinea-Bissau underwent profound cultural, political, and population shifts. During the early 13th century, the displaced Soninke, an ethnic group from GHANA, fled to Guinea-Bissau when the Almovarids subjugated Ghana. Later, the area became a coastal outpost of the Mali Empire. Portuguese advancement in ocean navigation and their desire for new sources of wealth combined in the mid 1400s to lead Portuguese explorers to northern and western Africa. Portuguese slave traders captured Guineans and sent them to plantations on CAPE VERDE, an island group off Guinea-Bissau’s coast. In the late 1600s, Guinea-Bissau became PORTUGAL’s first colony on the African continent. Despite pressures from other European colonial powers and colonized ethnic groups, Guinea-Bissau remained under Portuguese authority until 1974, when, after a 10-year war of undependence led by the African Party for the Independence of Guinea and Cape Verde, the Republic of Guinea-Bissau was proclaimed. The first 30 years of independence were fraught with difficulty. In 1980, Guinea-Bissau’s first president, Luis de Almeda Cabral, was overthrown by Prime Minister João Bernard Vieira. Supported by the military, Vieira ruled for 18 years, during which several unsuccessful coups were staged, political opposition was crushed, and ethnic tensions increased. Since 1998, Vieira and Kumba Yala, elected in 1998, have been deposed from power by coups. Partly because of political turmoil, an undeveloped infrastructure, and a dependence on subsistence agriculture, Guinea-Bissau languishes in poverty. Today, the country is one of the poorest nations in the world. Using key health indicators for 2001, poverty has compromised Guinean health. At birth, for example, Guinean women have only a 40.6-year life expectancy. Men are expected to live 36.1 years. Infant mortality rates of 195 and 213 per 1,000 live births for Guinean female and male children, respectively, rank among the highest in African regions according to the World Health Organization. Economic and health improvements are possible with international effort but only through sustainable growth projects that take the natural environment, citizens, and industry into consideration. As a republic, Guinea-Bissau is in its infancy, and as the 21st century unfolds, whether it matures into a stable country will be determined by its people and their leaders.